I got it from my local Office Depot, because the price was comparable with Amazon (it was on sale) and I didn’t have to worry about having a bulky item shipped. It cost less than $200. This machine can scan (and copy) at 11×17, and is also an inkjet printer that can print on 13×19 inch paper. I bought a package of 11×17 inch paper from Office Depot since it seems to be a better “bang for the buck” than 13×19, and is easier to find. I’ve already started using the Epson to “archive” my revisions to the pants pattern I’ve been fitting by scanning the front and back pieces in to the computer as chunks, and using Inkscape software to combine the scans into a full-sized scan in the computer. Here’s a tutorial video that shows you the process. I’ve also been examining Wild Ginger pattern-making software to use to create and alter my own patterns, then print them out on the printer. Wild Ginger’s CAD editor also allows you to take a scan or a photograph of a paper pattern and digitize it, so you can alter it onscreen. Wild Ginger’s Pattern Master Tailor Made software is geared specifically for menswear. It sells for $125, but for 2015 they offer 20% off many of their products if you purchase on the 20th of the month. I’ve downloaded their free demo edition (which doesn’t save or print) and am checking it out. It requires Windows, so that might be an issue for some. More on this in future articles. I think you are headed in a good direction. I have Wild Ginger Patternmaster Tailor Made, as well as Boutique. Knits, and Curves. AND I bought a wide format printer similar to yours. I do use the 13×19 paper, which I order online. It isn’t as cheap as 11×17, but it is nice to have fewer pages to tape. I enjoy following your posts. Thanks for the feedback. If you could share your source for the 13×19 paper, I’d be grateful! Sorry I didn’t include it initially. I had to go look it up. You have to like a web site that is called “Wide Format Outlet”. Just what we need. Thank you! And thank you for following my blog. Anyone who sticks with me through interminable articles on pants fitting deserves congratulations. Hey, it’s great that you’ve gotten the bug to master this challenge, and not just for yourself. I’m sure lots of useful stuff for the rest of us will come from your efforts! I certainly do wish Wild Ginger would run on a Mac; that demo video was very intriguing, but I hate the idea of buying Windows, too! Looking forward to your report on using their CAD editor. I’m a committed Adobe CC user and love Illustrator, but it takes some not-cheap plugins to make it really shine at pattern work. Glad you’re enjoying the book; thanks! Thanks for the additional paper source information. I also find PShop indispensable for merging and aligning scans before sending to Illustrator, and have set up a few actions to help. What do you non-Adobe guys use for that? Using a camera as in one of the WG YouTube videos seems like too much work by comparison, especially since scans eliminate the need to also rescale after making sure your camera’s square to the pattern or drawing. How’s the accuracy of your new printer? When I print a 10″ x 10″ box (made in Illustrator), my Brother laser printer is off by 1/16-1/8″ on one side. For that reason, I’m considering one of the smaller plotters. The Epson printer is pretty accurate. I’ve been printing to it from Wild Ginger and from Adobe Reader, and the printouts are faithful to the onscreen dimensions to the limits of the measuring rulers I have on hand. One thing about the Epson inkjet is that the lines and curves on the pattern print out a tiny bit uneven; I think it’s because the printhead spits out the ink as it moves left and right and the two directions don’t register perfectly. But it’s not enough of a discrepancy to matter. Other downsides to inkjets are the high consumables cost, and text quality that’s not as good as a laser. 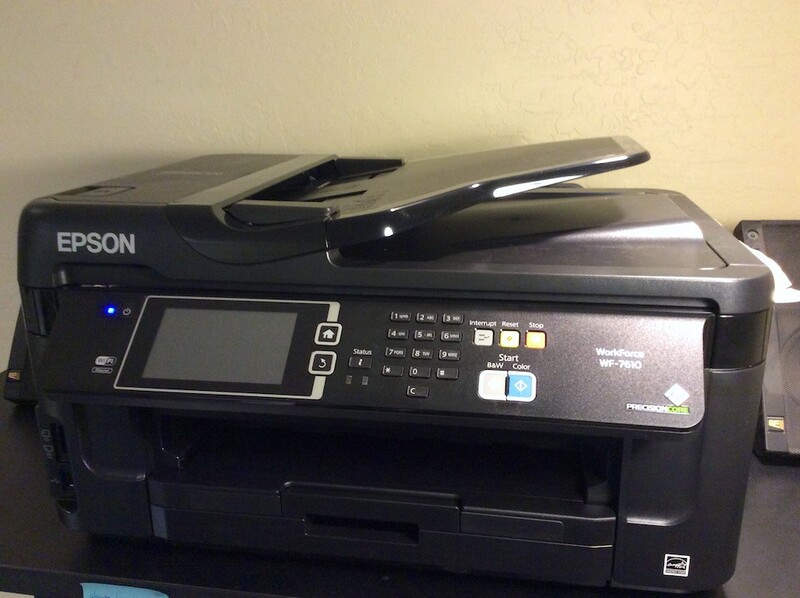 Finally, with Epson printers the print head is a part of the printer, rather than part of the print cartridge. Epson claims that gives higher quality printing, but if you’re an infrequent user it does mean you have to run a print job every now and then to keep the print heads from seizing up. Thanks for the reply! And, that’s awesome to hear that your printer is accurate. I’ll definitely have to look into getting the same model as you–considering it’s only $200 (vs $1,500 for the smallest and cheapest plotter).